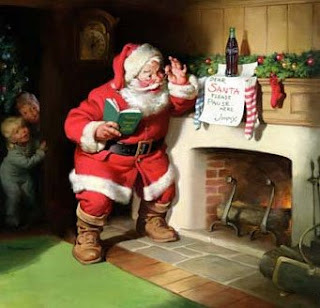 I found out the truth about Santa Claus because my dad overestimated my ability to fall asleep on Christmas Eve. I never could. My bedroom was right off the living room, and I could hear everything my parents talked about after their children went to bed. "I'll eat the cookies," my dad said to my mom, "and you can drink the milk." And in that moment, I realized that for all those years I had been duped. No wonder Dad always insisted we put out plenty of rum balls. And Mom! She was no better, drinking room temperature milk to make us think that Santa had done it. I had been thinking about the presents under the tree. Wondering if it were too early to get out of bed at 4. Or if maybe 5 would be better. It all depended on what time we could force our grandma to get up. She was, by nature, a late sleeper. But if we were loud enough, maybe she would take a hint. Our parents were also going to be a challenge. Mom was easy as long as she got some coffee. But Dad? He made delaying the opening of presents a big, sick game. Sometimes, he insisted on pancakes beforehand. Sometimes, he wasn't joking. And then there was the inevitable trip to the bathroom. And so as I lay there contemplating all of these things, my dad got hungry and decided to eat Santa's rum balls. I wasn't even that upset. I knew. I was probably seven or eight years old by then. But until I overheard my dad say it out loud, I still got to pretend it was all real. Part of the fun was waking up on Christmas morning, running out to the tree, and frantically reading labels to find the ones from Santa. I wanted to still look at the sky and try to spot the sleigh. I wanted to listen for hooves on the roof of our house. I wanted the magic. But if there's one thing you come to understand as you grow older, it's that the magic goes out of Christmas eventually, whether or not you're ready for it. One Christmas morning, you realize that you went to sleep at your normal time and slept all night without one thought about present opening or Santa Claus. You don't put cookies out, your parents go to sleep before you do, and the only insomnia you have is caused by your cat gagging on the spool of thread she tried to eat at 2 AM. You also come to realize that Christmas is about those things that don't change, no matter how old you get. For me, there may be no Santa. There may be no magic. But there is still my dad, rum balls, and that huge stack of puzzle books by the toilet. My boyfriend's cousin, who is an adorably nerdy 11, still believes in Santa. I found myself envious of her this year, seeing the genuine excitement about her Santa gifts. Also, you know what she asked Santa for this year? An overhead projector. And she got it and was more excited about that than the Wii she also received. It was hilarious and cute. My tummy hurts from laughing, almost as much as it did when I watched my dad open up his "prairie dog nativity scene" that Ladd made for him. On pooping dads: at least your dad didn't emit horrible constipated moans. aha! as a mexican, I grew up opening presents at midnight on Christmas Eve. I feel this is vastly superior, because it is a strict contract with no portion left up to adult interpretation. There is no guessing what is too early to wake up, or when the festivities can begin (before or after breakfast)! If someone is in the toilet at midnight, TOO BAD! The show must go on! Can we just talk about dads and bathrooms for a second, please? Because my dad will go into the bathroom, with the sports page, for about 8 hours. And not to poop, mind you, but to smoke the cigarettes he's been smoking for 30 years. We all know he smokes, and yet he chooses to hide in the bathroom and do so, as if we won't notice the giant cloud of smoke he leaves behind. Dads should be required, by law, to have their own toilets. @greta: I'm going to need to see a picture of this nativity scene. @M: I am completely envious. My dad could NEVER argue with that. Also, it is a good compromise for people who insist on opening presents on Christmas Eve and those who insist on waiting until Christmas morning. well my dad is also a very cool person.